For many, Fall is a favorite time of year, when you're ready for a rich ale, maybe some cool apple cider, or some other tasty treats. 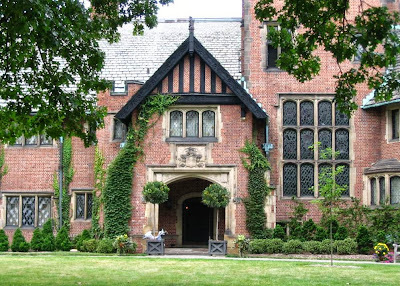 It’s also the time of year to visit Ohio Mart, Stan Hywet Hall & Gardens’ annual artisan craft fair— held in the beautiful gardens on the Estate. Fall colors will be in evidence again this year from Thursday through Sunday, October 3-6, featuring, 120 artisans selling jewelry, handmade textiles, ceramics, sculpture, garden art, photography and more. Ohio Mart Hours are 10am-5pm, Thursday-Saturday; and 10am-4pm on Sunday. Stan Hywet is located at 714 North Portage Path in Akron, Ohio. While Ohio Mart always features a great assortment of juried exhibitors, there are a wide range of additional other activities to keep you busy. The Vintage Finds and Curious Goods Sale features the unusual and the collectible. Inside the Manor House, you can experience Inspiration in Bloom, a display of fresh floral arrangements and the Fallscape--lectures/demonstrations on home décor. Both of these activities are available via a Combo Ticket, which includes Ohio Mart and a self-guided Manor House tour. Ohio Mart tickets: $9 adult, $2 youth (ages 6-17). Combo ticket: $15 for Ohio Mart + self-guided Manor House tour (includes Inspiration in Bloom and Fallfest). Onsite parking is $5. Free off-site parking is available on Saturday & Sunday with complimentary shuttle.